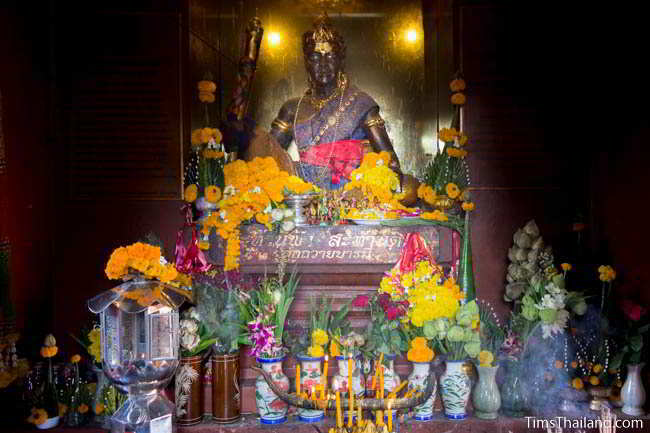 Khon Kaen city moved location several times during its first century of existence, and whenever there was a move, the leader built a new city pillar shrine. 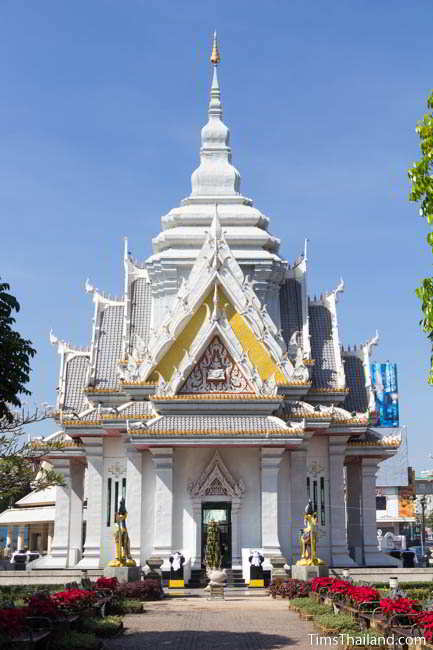 So, besides the large, modern main city pillar shrine in the city center, there are six other shrines in and around Mueang Khon Kaen that once served this duty. The years given here come from the book The History of Khon Kaen by Kru Bramuan Pimsen (ประวัติศาสตร์เมืองขอนแก่น โดย ครูประมวล พิมพ์เสน) though other sources sometimes show a slightly different timeline. 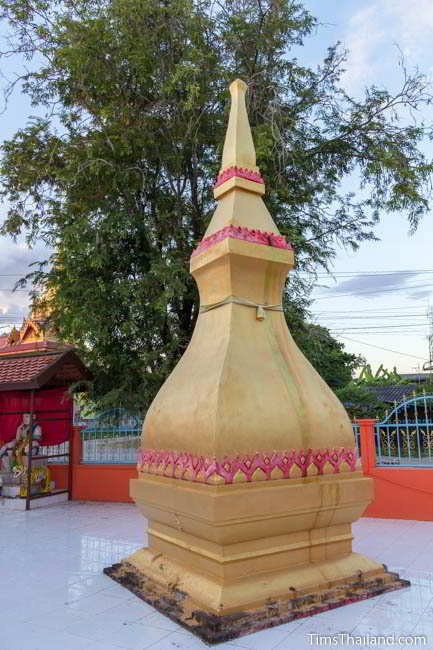 In 1789 Pia Mueang Paen, originally from Vientiane, along with 330 people migrated from what is now Ban Cheelon village in At Samat district, Roi Et province, to the west shore of Bueng Bon, the lake now called Bueng Kaen Nakhon. 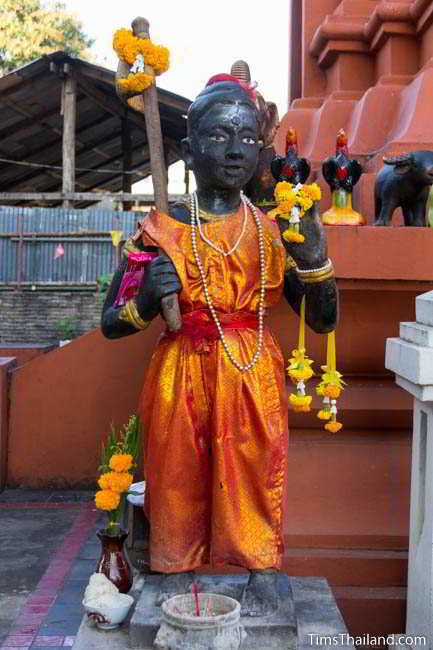 His daughter was one of King Rama's favorite concubines, so the story goes, and so he soon received royal approval for his settlement to be an official city under the control of the king's officials in Khorat. The city pillar was erected at the northwest side of the lake, between Wat Klang and Wat That, two of the three temples established in the early days of the city – the other being Wat Nong Wang. 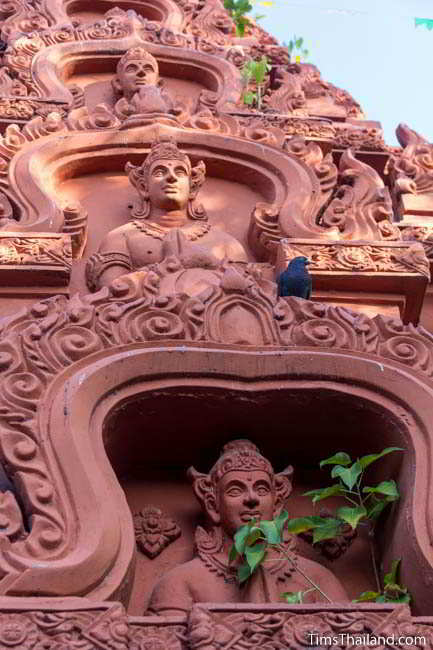 The neighborhood is now known as Ban Mueang Kao ("Old City"), but in the early days it was Ban Bung Bon. 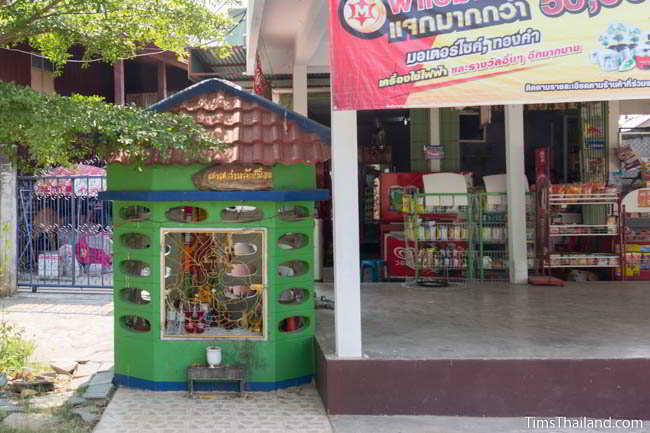 The shrine is on Soi Glang Muang 21 behind a large roadside gate. It remains a place of worship for people living in the neighborhood, though few others in the city know that it exists. According to two old ladies living in the neighborhood, the original wooden pillar is inside the current concrete one. There are simple Buddha life story murals behind the shrine and delightfully faded Ramakien murals along the street in front. In 1809 the city's leader, Thao Kam Yuan, relocated to Ban Don Pan Chat (now called Ban Non Mueang) at Amphoe Kosumphisai, Mahasarakam province. 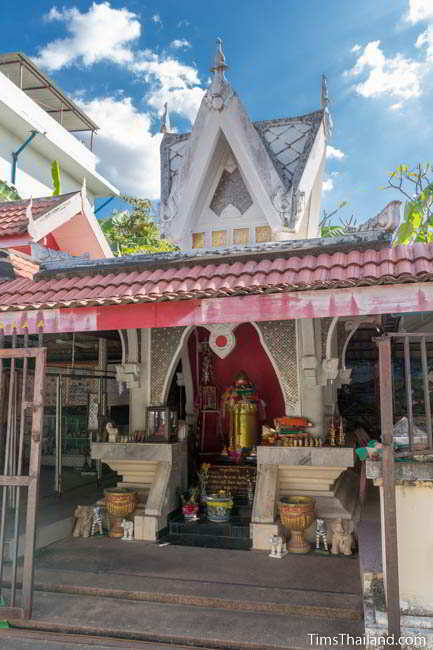 The simple two-sided shrine in the back of Wat That Non Nakhon temple no longer has its pillar and there are no statues or other objects of worship in either of the buildings, but local people still leave offerings. 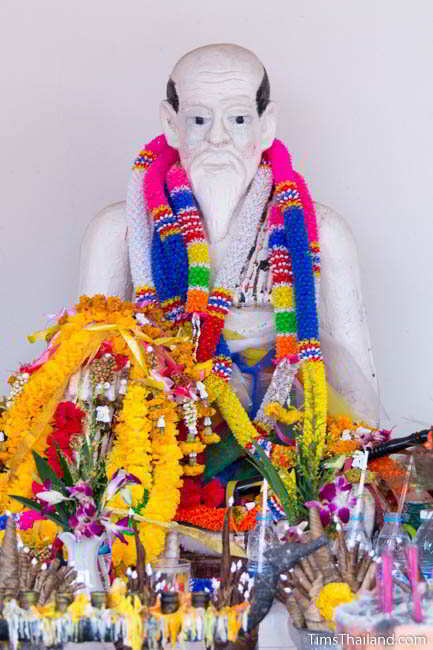 The next city leader, Thao In, Thao Kam Yuan's son, moved Khon Kaen back to Bueng Bon (Bueng Kaen Nakhon) in 1838, this time settling on the northeast shore in what is now known as Ban Nontan. 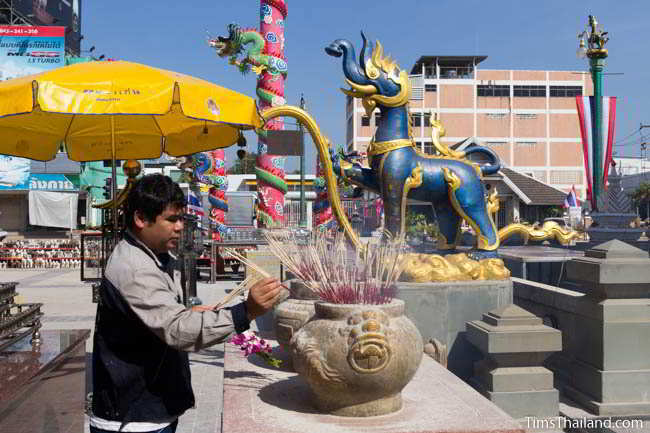 He erected the city pillar at what is now San Jao Bueng Tao Gong Ma, Khon Kaen's largest Chinese temple. 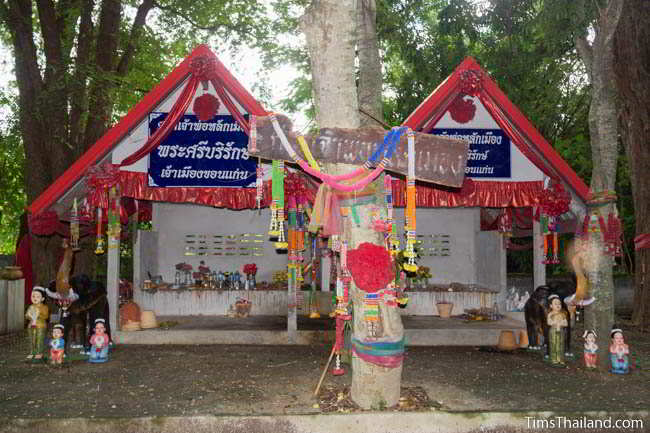 He also made a shrine for a local spirit named Ya Ku Yen. Ya Ku Yen was a strict and critical, but highly respected monk who used to be called Ya Ku Grot. (Grot means "strict" and yen means "cool" – the new name was adopted in 1939 to soften his image). He understood magic and superstition, fortune telling in particular, and practiced herbal medicine. Though he became a high-ranking monk, he lived out his final years as a taa pa kao lay man who faithfully followed the eight core Buddhist precepts and always wore white. The pillar is gone, but the San Jao Ya Ku Yen shrine remains, and it received a modernization not long ago. 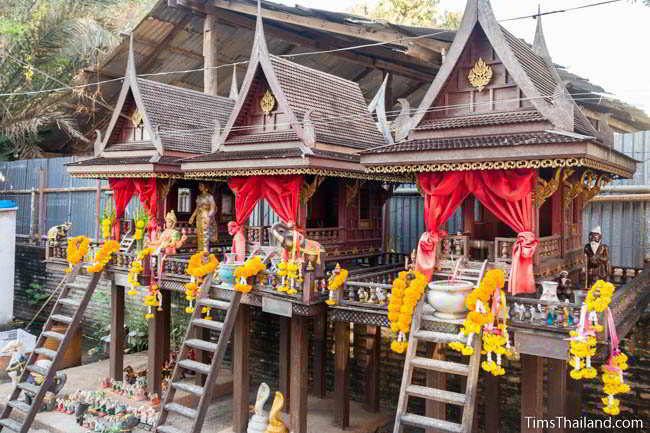 It's the Thai-style building next to the main temple building. The two statues of him inside the shrine show him weaving beads and holding a stylus, used for writing palm leaf manuscripts. In 1868 the city split into two, with Tao Ou moving his followers five kilometers south to Ban Don Bom along the Chi River while the rest remained at Ban Nonton. He got royal recognition of the new town in 1877. The current green concrete shrine sits alongside a small grocery store and doesn't look like a sacred site. 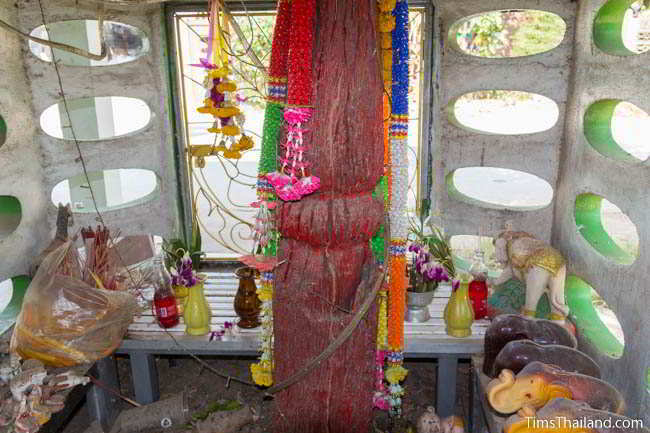 Inside is the original small wooden pillar, still serving as the home of the local guardian spirit. In 1881 the people at Ban Nontan were ordered by the government to move to Ban Thum, about 15 kilometers west of Bueng Kaen Nakhon, as it was decided that this was going to be the population center for this area because it was along the ox-cart road from Bangkok to Udon Thani, the administrative center for northern Isan. The government developed the town with modernities such as a telegraph system. Ten years later, Thao Ou reunited the two groups by abandoning Ban Don Bom and moving to Ban Thum. 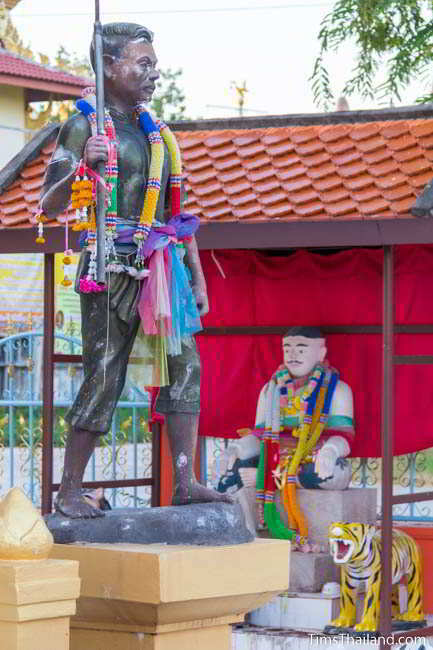 The shrine is at the corner of a soccer field and is guarded by statues of soldiers. A brick and stucco stupa has replaced the original pillar. In 1899, a lack of sufficient water drove the city back to where it started, Bueng Kaen Nakhon. The city hall and governor's residence were built at the junction of Nikon Samran and Sri Nual roads, where the Public Relations Department office is now, and a new city pillar shrine went up to the south of this, just 100m east of the original. The pillar is no longer here. 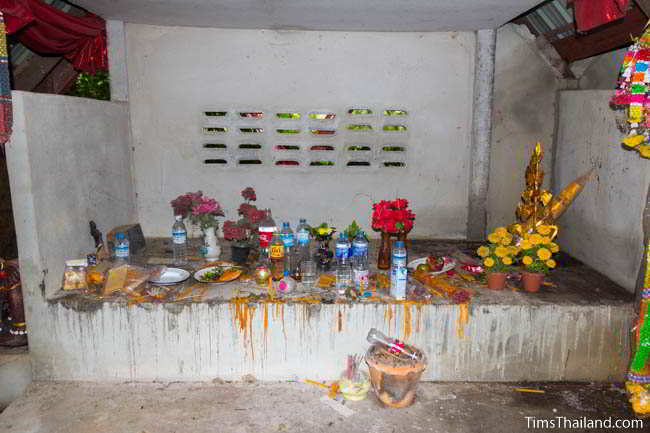 Instead there's a Mahesak Shrine, dedicated to the god Indra who is very important in the Buddha's life story. Mahesak means "the greatest of gods" and Indra was this in early Hinduism before the trinity of Shiva, Vishnu, and Brahma rose to prominence. 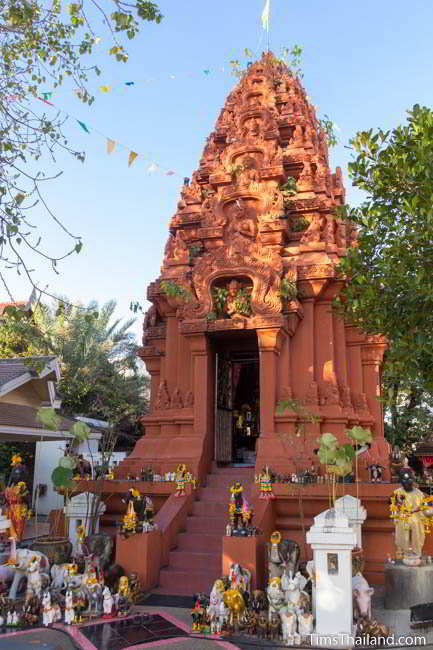 In 1993 it got a major makeover with the construction of a Khmer-style main shrine. The seven spirit houses that were previously the focus of worship are now lined up in the back. 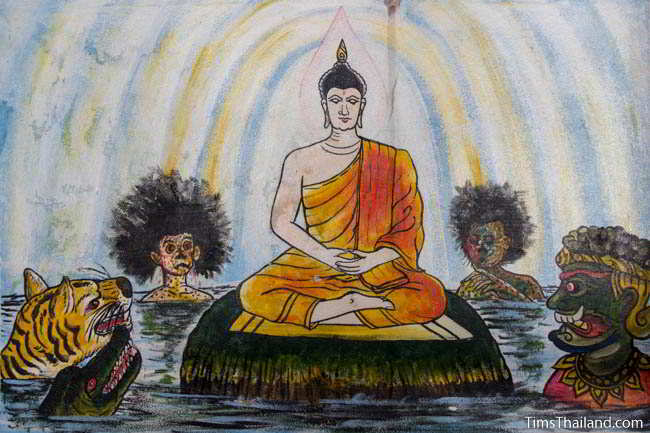 In April 1955, a man told Luang Pho Gunha, a senior monk at Khon Kaen city's Wat Sri Nuan, about a recurring dream. In it, an old man in white clothes was saying things like "I want to live in a city" and there were many old bai sema sacred boundary stone markers around laying around. 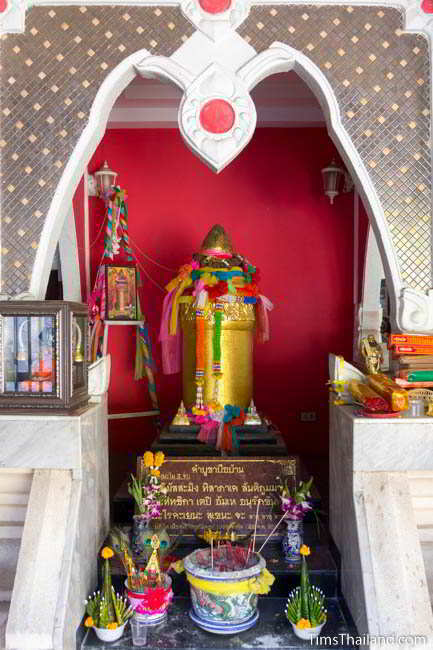 Luang Pho divined that the dream must refer to a city pillar. 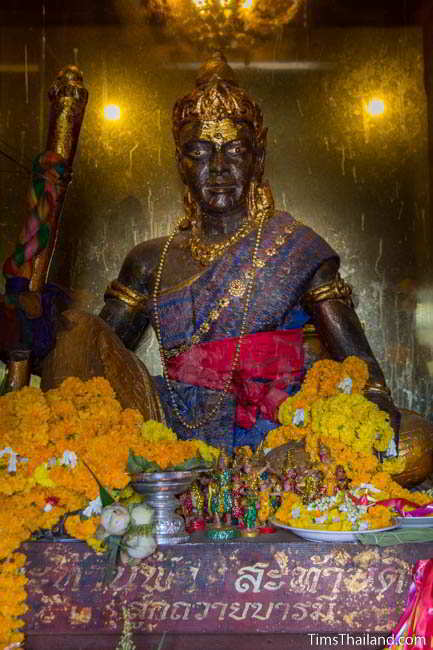 And since Khon Kaen, unlike many other Thai cities, did not have a big fancy city pillar shrine, he told the story to Khon Kaen's governor, who decided to build one. Four old sandstone Dvaravati bai sema from the Chumpae area were invited to come, but when they were being moved a storm brought heavy rain and lighting and the truck moving one of the stones got stuck in mud. People discussed the difficulty and decided that the pillars did not want to come because the invitation was insufficient, since no important people had come. So, Luang Phor Gunha took a mor lam music and dance group and a movie projector to where the stones were being kept and held a large celebration at night before inviting them out the next morning. That day everything went smoothly. 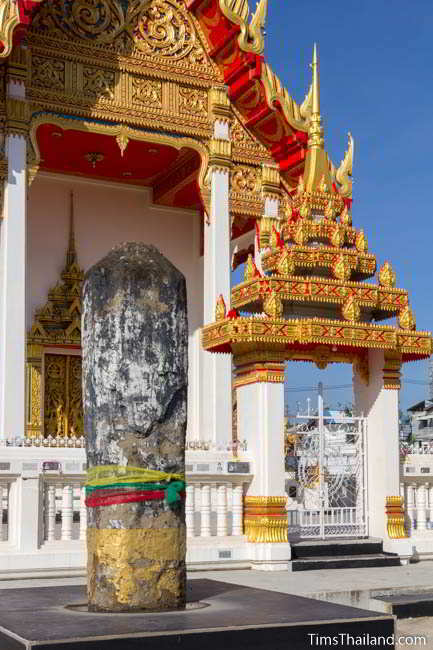 The stone that became Khon Kaen's city pillar is three meters tall with an octagonal shape and a lotus base. 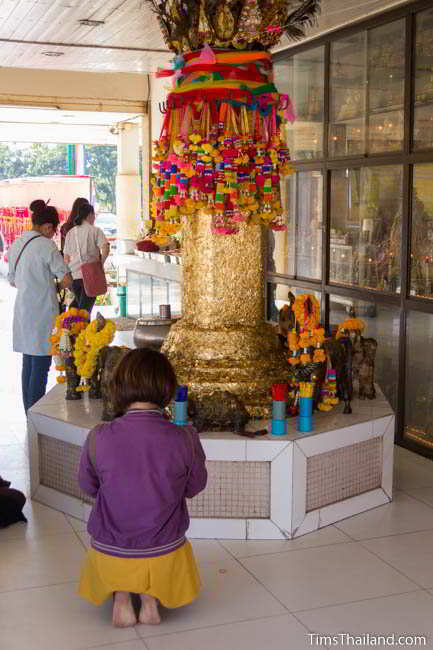 A "fake" city pillar sits in front of the shrine so that people can attach gold leaf to it, which is not allowed on the actual pillar. When a large wish comes true, particularly getting a winning lottery number, people hire one of three movie projector trucks to show films in the adjacent parking lot as a thank-you offering. On rare occasions, a projector is taken to the Mahesak shrine for a showing. 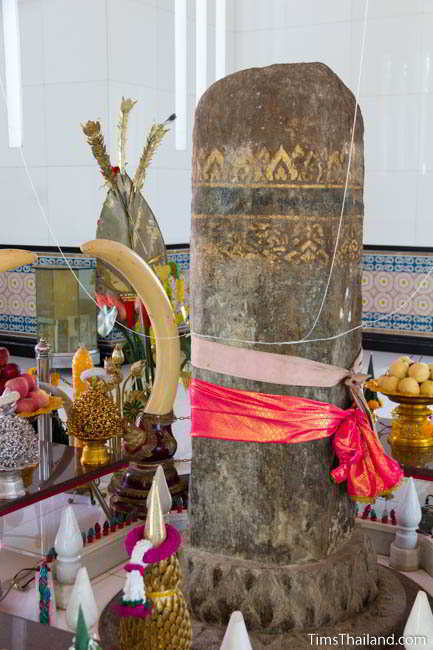 When constructing Khon Kaen's current city pillar shrine, four old Dvaravati bai sema stones were taken, but only one was used in the shrine. 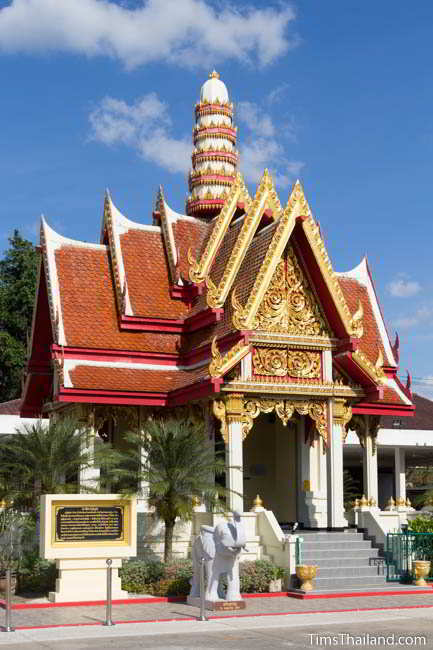 One became Chumpae's city pillar and the other two went to Wat Sri Nuan in Khon Kaen, where Luang Pho Gunha was a monk. One has the same octagonal design as the city pillar and the other has the classic flat bai sema shape with a "sword" design carved on it. They're now standing in front of the ubosot (ordination hall).